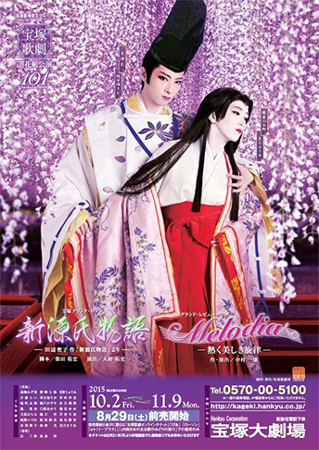 From Melodia: Music and vocals have been replaced for "Spain" from scene 14A and 14C, "My Favorite Things" from scene 19, and "Entre Rejas" from scene 20. (1) Kano Maria in Takarazuka. (2) Hina Ririka in Takarazuka. † As of 11/27 Ousaki Ayaka will be absent due to poor physical health. Shiroki Mirei will assume the role of Murasaki no Ue while Haruhi Urara takes her role as Kumoi no Kari. Announced on 11/30: instead of Haruhi Urara, the role of Kumoi no Kari will be played by Oto Kurisu. Hikaru Genji was born to Kiritsubotei when he was Emperor, as the second imperial Prince. Since childhood, he has harbored feelings of love for Fujitsubo-no-Nyogo, the Empress of Kiritsubotei. She is the living image of his late mother, Kiritsubo-no-Koui. Genji grows up to become a strikingly beautiful young man, whom the people call “the Shining Prince”. One night, he is unable to control his yearnings. He sets off for the Sanjo estate where Fujitsubo is visiting her parents, as the Milky Way shines brightly. With unrestrained passion, he embraces Fujitsubo. She, leaning on Genji, is unable to calm her heart. The couple have knowingly committed the sin of forbidden love. Afterward, tortured by his secret romance, Genji chases shadows of Fujitsubo by having numerous trysts with a variety of women. One of them is the proud and noble-looking Rokujo-no-Miyasundokoro. However, Genji responds to her quite fervent love but tending to keep his distance from the Rokujo estate. Also, his relationship with Aoi-no-Ue, his haughty first wife, is no longer the way it was when they first married. This leaves him with the opportunity to encounter a beautiful young girl at a priest’s hermitage on Kitayama. Young Murasaki in some respects looks like Fujitsubo. Genji enlists the help of his attendant Koremitsu in an attempt to bring her closer to him so he can mold her into his ideal woman. After taking her away from a protesting nun, he brings the girl to his estate. One afternoon in spring, Hikaru Genji, encouraged by Emperor Kiritsubo, who is delighted with the Prince’s birth, to hold the handsome, noble child (later to become the Emperor Reizei) in his arms. In fact, the prince is an illegitimate child born between Genji and Fujitsubo. His heart contains a mix of joy and dread. Emperor Kiritsubo eventually abdicates. The Emperor Suzaku, Hikaru Genji’s elder brother, is enthroned. The new Emperor is the child of Kokiden-no-Nyogo, a court lady from the family of the Minister of the Right, a political foe of Genji. The carriages of Rokujo-no-Miyasundokoro and Aoi-no-Ue collide while the two are out on an excursion on the day of Kamo-no-Saiin-no-Misogi, and conflict ensues as a result. From that point on, the vengeful spirit of Rokujo-no-Miyasundokoro makes trouble for Aoi-no-Ue every night. Aoi-no-Ue passes away, leaving behind Genji’s child Yugiri. Genji’s heart is in turmoil. The pure form of Young Murasaki (to become Murasaki-no-Ue) is the only thing he takes comfort in. As time progresses, she grows into a fresh and well-rounded woman, and the two marry. Genji appears to put aside his associations with other women. Even so, he succumbs to a dangerous romance with Oborozukuyo, the younger sister of Kokiden-no-Nyogo and much-loved mistress of Emperor Suzaku. The Minister of the Right and Kokiden-no-Nyogo find out about the relationship. Sensing he is in danger, Genji makes a firm decision to leave Kyoto and go to Sumanoura. After time passes as if in a dream, Genji returns again to Kyoto. Emperor Suzaku abdicates and Reizei is enthroned. Spring comes again for Genji, who has become a guardian for the Emperor Reizei. Both his once-young son Yugiri and the son of Tonochujo, Kashiwagi have grown into splendid youths. Tonochujo (the Interior Minister) is a close friend and worthy opponent of Genji’s. It seems no clouds at all hover over Genji’s prosperity. But, he is about to receive his destiny’s retribution, which will come in an unexpected form. This performance comprises a number of musical pieces played to passionate as well as beautiful melodies and rhythms that generate excitement. They all are part of passionate and beautiful tunes that brim with love, dreams, hopes, passion, sorrow and an energy that knows no bounds. The revue weaves together the charm of the Flower Troupe, led by Asumi Rio who brims over with brilliance and youth, through lively songs and dancing. Shibata Yukihiro's The New Tale of Genji was first performed by Moon Troupe in 1981, and then revived in 1989. Final performance for Maki Izumi and Himeka Hinano, also for fukukumichou Shihou Nanami. Though originally sheduled to perform, Hizuki Yume retired on August, 21st without prior announcement. 25/09/15: Otohane Emi will be absent from the Takarazuka run (both hon-kouen and shinjin kouen). Created by daimon_sakura. Last Modification: Monday 25 of February, 2019 06:48:01 PST by caithion.